A new generation looks beyond the Ivies and party schools to colleges that teach how to change the world. Better yet, some are already changing it. 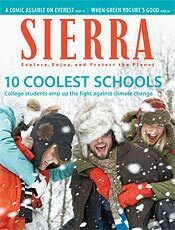 From tiny Warren Wilson College (850 students) to the University of California (214,000 and counting), here are Sierra's Big Ten. Go ahead—steal these great ideas for your own campus. Want to save the earth and make a living too? Here's what it takes. The students at John Muir Elementary don't know much about their school's iconic namesake, but they learn to share the bearded white guy's love of the wild. Love 'em or hate 'em, off-road vehicles are reshaping our public lands. Into Hot Air — "Funny stupid" or just "stupid stupid?"